A radioactive waste specialist has said that the high-level radioactive waste pools at the crippled Fukushima Daiichi nuclear power plant in northern Japan remains at risk of further contaminating the region and the surrounding Pacific waters if another major earthquake and tsunami were to strike the area. Kevin Kamps, in an interview with Gary Franchi of WHDT, said that few lessons from Fukushima have been learned in the United States, with one of the most important being that high-density pools at U.S. nuclear plants should be emptied into hardened on-site storage areas as soon as possible. "Scientists say that very low levels of radiation from the Fukushima nuclear disaster are now about to reach ocean waters along the U.S. West Coast next month. But it will not be at levels dangerous to humans or wildlife. They are calling for more monitoring, as no federal agency currently samples Pacific Coast seawater for radiation. They say unless we have results, how do we know it's safe? It's been three years since the Fukushima disaster, and thousands in Japan have called on the government to rid themselves of all their nuclear power, for good." As far as claims by the U.S. government that radiation levels remain low along the West Coast, Kamps said such claims "need to be taken with a grain of salt." "It's been known for decades -- and it's not me saying this, it's the U.S. National Academies of Science -- that any exposure to ionizing radioactivity, no matter how small the dose, carries a health risk for cancer. And the higher your exposure to ionizing radioactivity, the greater the risk." Kamps went on to say that "these risks accumulate for a lifetime." So, are U.S. government agencies being honest with the American people by saying that there's no threat, when it seems clear there is, Franci asked. "I think there's a lot of secrecy, there's a lot of cover-up, there's a lot of minimization, and this goes back to the earliest days of the atomic age with the Manhattan Project," Kamps said. "Incredibly enough, the same behavior takes place on the so-called 'peaceful atom' side of the coin" as well, he said. "So, it's a constant battle to get the truth out," Kamps continued. "We have that battle here in the U.S. They certainly have the same battle in Japan." Franci asked if the governments were being hush-hush about the potential for contamination in order to avoid widespread panic. "More to the point is that the nuclear power industry here in the United States is very politically powerful, very economically powerful [and] they have a lot of friends in high places in government, including, of course, the Nuclear Regulatory Commission." Kamps added that the day of his interview the NRC's public affairs office even acknowledged that the agency knew much more about the Fukushima incident than they ever released to the American public. "Here it is three years later and, through the Freedom of Information Act, finally, more truth is coming out," he added. "But it took three years to get there and a prolonged struggle with the NRC." Since the March 11, 2011, earthquake and resultant damage at Fukushima, Kamps said, "we've learned that this is a global catastrophe. You mentioned the other shoes that have not yet dropped at Fukushima Daiichi, and we pray that they don't. " 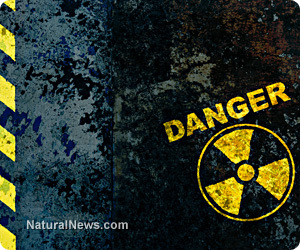 "The condition of the high-level radioactive waste storage pools at the Fukushima-Daiichi reactors remains perilous. Another big earthquake could prompt a sudden drain-down of the Unit 4 high-level radioactive waste storage pool. The Unit 3 pool may be in even worse shape," Kamps said.